Could this be it? We wonder each time a fire breaks out near our property. This fire is within 3 miles of our property, and upwind. The last two have been even closer. We're not ready -- we won't be, for another 3 or 4 years of thinning and pruning. We could lose everything, even after all of our work to make our property less susceptible to a devastating crown fire. Tripp Canyon fire about 1/2 hour after it started today. The Tripp Canyon fire began at about 11 a.m. today (10/11/09, see updates below) when a debris-pile burn at a home got out of control. I drove out US Highway 2 at about 11:30 to see what the smoke was about. It was a thick brown column of smoke typical of a hot forest fire, but it looked very small. Fire trucks passed, headed that way. The heliport in Cashmere was empty of their large, fire-fighting choppers. I've wondered, lately, what goes into setting the Industrial Fire Precaution Level. For the past month the IFPL has been I, its lowest danger level. Any type of logging activity is permitted, and there is no burn ban. But the ground is dry, dry, dry. There has been precious little rain. Dry leaves are falling, and days are increasingly windy. This is when man-made fires get away from people. By 2:00 the smoke had turned white, and looked about the same size, so I breathed a sigh of relief assuming it was under control. Then a friend called my mobile at 5:30 to say the neighboring Brisky Canyon was under an evacuation advisory. Smoke hung over Blewett Pass at sunset, and the air smelled of wood smoke. As of 7:45 pm, it reportedly was still actively burning in brush and timber. About 50 firefighters were working the fire this afternoon. Three helicopters dropped water on the blaze. The Sheriff's Office told reporters the cause of this fire (a burning debris pile) is being investigated by DNR officials -- "but the fire appears to have been legal since the county-wide, open-burning ban was lifted earlier this month." I must have burned a hundred large piles of debris just in the past 7 years, and I would not dare light a pile until there's snow on the ground. "Fuels and dryness are a huge indication that we’re going to have fire season until we get some snow," a Sheriff's Office spokesperson cautioned last Monday, less than a week before this fire. Why can't people wait to burn their leaves and debris after the fall rains drench everything? It's only a week or two away. Folks here complain about burn bans. Today is evidence that, in the absence of rules and fines, a few people will not exercise common sense. 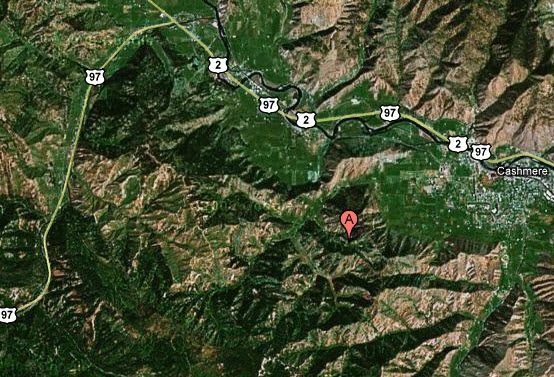 SUNDAY -- The local newspaper says the fire is burning on state Department of Natural Resources land. Firefighters from Cashmere, Dryden, Monitor, Peshastin, Entiat and the Department of Natural Resources responded to the fire. 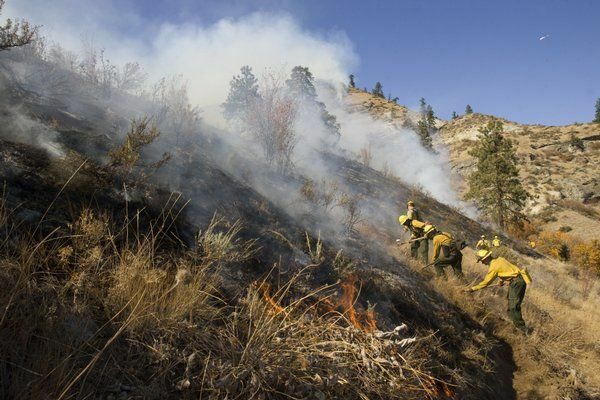 The Chelan County Sheriff's office says about 135 firefighters from multiple agencies will be assigned to the fire starting early Monday, and the three helicopters will be back dropping water. DNR was not quoted in the update. A local radio report said the fire was at 100 acres and still uncontained at the end of the day. MONDAY -- Spread from 300 acres this morning to 400 acres this evening. Evacuation advisories have not changed for 30+ families; no one has been evacuated, and roads are open. DNR blog post offers limited info. Local news says crews are hoping that snow and rain forecast for this evening and Tuesday will help contain the fire. On the other hand, if winds shift, the fire could rush toward homes -- including ours. TUESDAY -- 450 acres/10% contained this morning with "minimal fire activity." Calm winds and a cool night helped, but firefighters still haven't got the fire under control. Local news reports said officials were hoping snow would. Chance of light snow was in the forecast for this morning, but didn't materialize. By mid-day the fire grew to 525 acres/60% contained. This evening, officials assured residents that the evacuation advisory will be downgraded by dawn tomorrow if mop-up progresses at its current pace.